DON’T LET HANDS GIVE YOUR AGE AWAY! For years, the only way to tell real age was to look at hands. Thin, veiny hands with age spots were a dead giveaway of a person's real age. Not anymore! As we age, our hands lose volume. As a result, veins can bulge, protrude and acquire a bony look. The skin on the back of the hands can develop age and sun spots. The good news is there are many treatments available to help rejuvenate and refresh aging hands. There are treatments available for skin rejuvenation. Nowadays many are opting for hand rejuvenation procedures. Though there are some brightening creams and chemical peels or laser therapies available but most prominently fillers, fat grafting essentially do the most improvement and replace lost volume. These procedures can improve the appearance and turn the clock back for 1-2 decades. At Elite Medical Clinic of Rocklin, Dr Ray performs the consultations and explains all options for hand rejuvenation to you. Schedule a complimentary consultation with Dr. Ray Today! 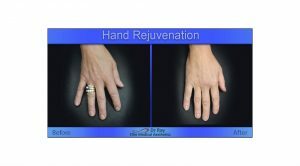 Hand Rejuvenation in Rocklin and Greater Sacramento Area! Soft tissue fillers can add volume to thinning hands. Radiesse was the only filler that is specifically approved for hand augmentation by the US Food and Drug Administration. Recently FDA approved Restylane Lyft for hand rejuvenation. Fillers offer immediate results and last 12-18 months in most cases. Recovery time for fillers is very minimal. Taking little precautions, can resume daily activities on the same day or next day. Cost may vary depends on number syringes required to add volume to the hands. It may cost between $600-$1500. Aside from fillers, Fat transfer and Fat injections also have a role in plumping up the hands. Fat tissue must be obtained from another area, abdomen, or flanks then process and concentrate it, and re-inject it into the back your hands. Lasers such as the Fraxel can improve lines, wrinkles and age spots. The Fraxel works from the inside out by spurring the production of collagen, the protein that gives skin the supple quality most associated with youth. One important aspect Dr Ray recommend is to use skin care products to maintain the hand skin health. Moisturizer, Retin A, anti-oxidant and sun blocks. Dr Ray at Elite Medical Clinic explains the best options for your hands rejuvenation. Ready to learn more about the Hand Rejuvenation procedure and find out if you are a good candidate? Call 916 500-2474 to schedule a complimentary consultation with Dr Ray at Elite Medical Aesthetics, Rocklin or fill out the request for consultation form.